Today we are at an exciting threshold of biology. Advances in DNA sequencing, coupled with high-end computation, are opening a frontier in new knowledge. Obtaining genetic information and obtaining insight from it have never been cheaper. 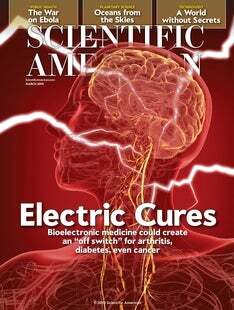 The potential for curing previously incurable diseases, including chronic ones, seems immense. If this sounds familiar, you might be thinking that you heard it 15 years ago, when the Human Genome Project was in full swing. Many feel that genomic medicine has not yet delivered on its promise. So what is different this time with the microbiome? For one thing, you cannot really change your genome, but each of us has changed our microbiome profoundly throughout our lives. We have the potential not just to read out our microbiome and look at predispositions but to change it for the better. What is most exciting at this stage is that we have mouse models that let us establish whether changes in the microbiome are causes or effects of disease. For example, we showed in collaborative work with Jeffrey I. Gordon's laboratory at Washington University in St. Louis last year that transferring the microbes from an obese person into mice raised in a bubble with no microbes of their own resulted in fatter mice. Normally, germ-free mice exposed to a mouse with microbial-based obesity would themselves become obese, but we could design a microbial community taken from lean people that protected against this weight gain. Similarly, we could take microbes from Malawian children with kwashiorkor, a profound nutritional deficiency, transplant them into germ-free mice and transfer the malnutrition, although the mice that received the microbes from the healthy identical twins of the sick children did fine. Remarkably, the mice that got the kwashiorkor microbiome, which lost 30 percent of their body weight in three weeks and died if untreated, recovered when given the same peanut butter–based supplement that is used to treat children in the clinic. The germ-free mice are far too expensive to deploy in Malawi, Bangladesh and the other sites in the Mal-ED (pronounced “mal-a-dee”) global network for the study of malnutrition and enteric diseases collaboration with which we work. Thus, we are trying to move from the mouse model to a test-tube model and ultimately to a primarily computational model based on DNA sequencing that is so inexpensive, it is effectively free. With crowdfunded projects such as American Gut, which already has thousands of participants who have had their microbiomes sequenced, and studies of people whose lives are very different from modern Western civilization, such as the Hadza of Tanzania, Yanomami of Venezuela and Matsés of Peru, we may be able to replenish our ancestral microbes and discover new ones that help to maintain health for individuals or entire populations. A good analogy is iodizing salt: Instead of understanding in detail why some people but not others were susceptible to cretinism and goiter, adding a nutrient to the food supply greatly reduced incidences of these diseases. Perhaps the same type of intervention is possible using some of the microbes that we are now discovering Westerners lack. Rob Knight is a computational biology pioneer, co-founder of the American Gut Project and director of the new Microbiome Initiative at the University of California, San Diego.